Angel Yin displayed her vast potential and power off the tee as well as a soft touch around the greens in a three-way play-off to capture the Omega Dubai Ladies Classic in a riveting finish at Emirates Golf Club on Saturday. The 19-year-old Los Angeles native saved par after finding the water on the closing hole in a bogey-free final round of 67 to match the clubhouse target of a 15-under-par set by South Korea’s In-Kyung Kim and Celine Herbin of France. Long-hitting Yin, who averages 276.75 yards off the tee, and Kim birdied the first extra hole (the 18th) to stay in the hunt while Herbin was eliminated after finding the water with her third shot. A tap-in birdie on the drivable second playoff hole (254-yard, 17th) saw Yin clinch the issue as the South Korean agonizingly missed her birdie effort in the first ever play-off since the tournament’s inception in 2006. “I feel amazing. 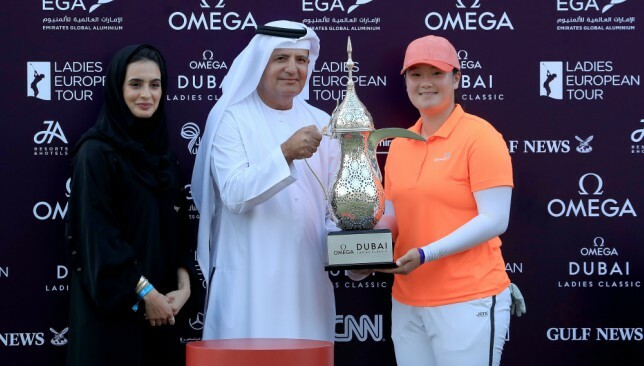 Actually, it’s my first major tour professional win, so this is big for me,” said an elated Yin after receiving the winner’s trophy from Hend Bilselah and Walid Al Attar of Emirates Global Aluminium. “It’s been a long week and I’m happy to be here in Dubai for the second time. I had a great time last year and I’m happy to be here again,” said Yin, who tied for 10th in the event in 2017. “Two days ago, I went to the aquarium in the Dubai Mall and today I’m going to see penguins with my friends — yes! I loved the course and it was in great shape,” said the rising star who became the second American after Lexi Thompson to win the season-ending Ladies European Tour event. Herbin, who shot a final round of 64, wasn’t too disappointed at being eliminated with a double-bogey on the 18th hole after finding the water with her third shot. She said: “I mean, it was really a bonus for me to in this play-off today. It was an awesome round for me, my personal best, minus eight and I had nine birdies. I enjoyed it a lot today. “I played very well, really, but so I spent a little bit too much time without playing. I finished earlier and I lost a little bit of rhythm, I would say. I could feel it on the drive and even the 7-iron on the lay-up. Kim, the 2009 champion, admitted that she was disappointed to have missed her birdie putt from six feet on the 17th hole in the play-off, but felt that she had given it her best. Overnight leader Anne Van Dam fired a final round of 71 and ended two strokes back in fourth place, with Aditi Ashok, Charley Hull and Pernilla Lindberg tied for fifth. Thidapa Suwannapura was eighth, while Olivia Cowan and Michele Thomson completed the top 10 spots. Georgia Hall, who had already wrapped up the Order of Merit, tied for 21st place and a tie for 66th was enough for Camille Chevalier to end the season as the leading first year professional and be crowned as the LET Rookie of the Year. UAE’s Khalid Yousuf is encouraged by his tied fourth-place finish at the Arab Golf Championship in Aqaba, Jordan last weekend, which saw him become the first Emirati golfer to shoot under par in the history of the event. The UAE national team finish ninth overall at the Ayla Golf Club with Yousuf putting together a promising performance among 52 golfers from 11 Arab countries. With rounds of 69 – 75 – 73 – 69 for a championship total of 286, Yousuf finished only four shots back from the leader and ended his championship two-under-par. The tournament witnessed a thrilling finish with Moroccan duo Dahmane Soufiane and Omar Ayoub both shooting final rounds of 66, but it was the former who clinched the individual title from his fellow countryman with a total of six-under-par 282. Issa Abu Al Ella of Egypt finished third. 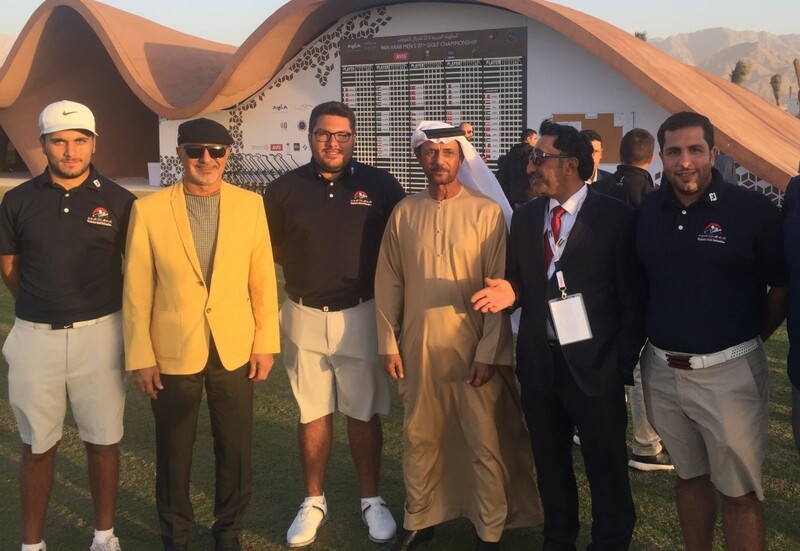 “It’s encouraging to see the level of Arab golf improving each year and it’s always nice to see other Arab golfers doing so well,” said Yousuf. “I was extremely happy with my game this weekend considering the windy and cold conditions. The UAE team finished ninth overall in the team category out of 11 teams, with Morocco walking away with the team title. Ahmed Skaik, who was UAE’s second-best player, had a slow start but finished strong with rounds of 86 – 78 – 77 – 74 for a championship total of 315. 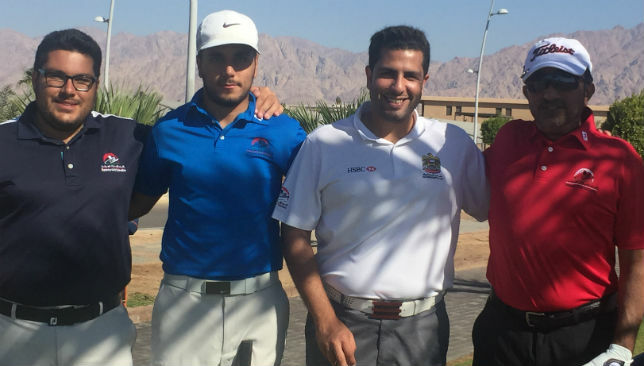 Competing in his first Arab Golf Championship, Abdulwahed Al Qasem had the pressure of providing the team with its third and final score each day. Al Qasem finished with a total of 386 for the championship. 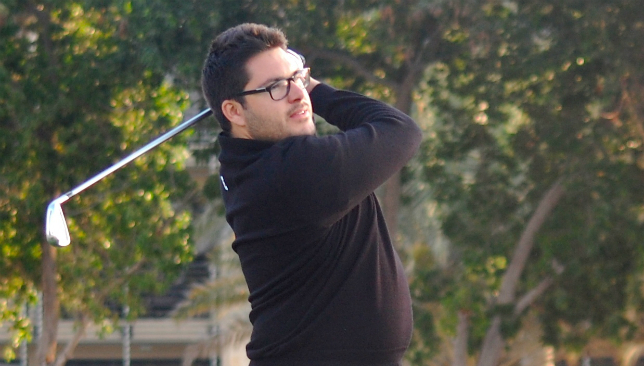 The UAE team finished ninth at the Arab Golf Championship. Tunisia took home team silver while Egypt won the bronze. Moving forward the national team will turn their focus to the Emirates Golf Federation Order of Merit events. The next international event will be the GCC Golf Championship taking place in March 2018. The UAE national golf team will kick off their campaign at the 37th Arab Golf Championship on Wednesday at the newly-opened Ayla Golf Club in Aqaba, Jordan. Over 52 players from the the Arab Golf Federation will compete in the four-day event with Khalid Yousuf, Ahmed Skaik, and Abdulwahed Al Qasem representing the UAE. The Ayla Golf Club is an 18-hole par 72 championship golf course designed by the legendary Greg Norman. During the first week of October, the Ayla Golf Club hosted their first professional event which was the MENA Tour’s “Jordan’s Ayla Golf Championship”. Both Yousuf and Skaik played in the MENA Tour event which provided some much-needed course experience for this Arab Golf Championship. The UAE team are targeting the top spot in Jordan having had a solid three-month preparation period that included a strong practice schedule and appearances at the Asia-Pacific Amateur Golf Championship in New Zealand and the 2017 Nomura Cup in Malaysia. Yousuf and Skaik will be looking to battle at the top of the leaderboard in the Individual Category, while Al Qasem playing in his first Arab Golf Championship will be looking to provide a strong third score for the Team Category. The UAE Team will be accompanied by Sheikh Fahim Bin Sultan Al Qasimi (Emirates Golf Federation Chairman and Arab Golf Federation Chairman), Adel Zarouni (Emirates Golf Federation Vice Chairman and Arab Golf Federation Vice Chairman), and Khalid Mubarak Al Shamsi (Emirates Golf Federation Secretary General). The Championship is run over four rounds (November 29 – December 2), the best three scores in a team of four are counted toward each round. Individual scores of players from each country are also recognized for individual gold, silver, and bronze medals.